As we promised back in August we’re going to do our best to bang out an update of our popular Startrail maps every three months or so, and here are your December updates. They are perfect for printing out to use as Christmas present wrapping paper, or saving as a graphic to include in your end of year email update to investors, staff and friends of your startup. 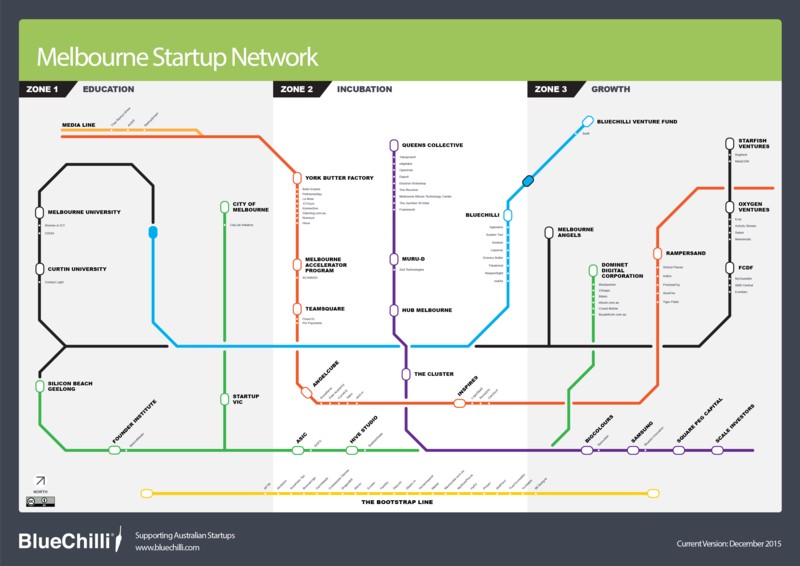 The StartRail maps are a popular visualisation of the Australian tech startup community that started out as a short project for an intern designer and grew much larger, very quickly, as the Australian startup ecosystem grew. 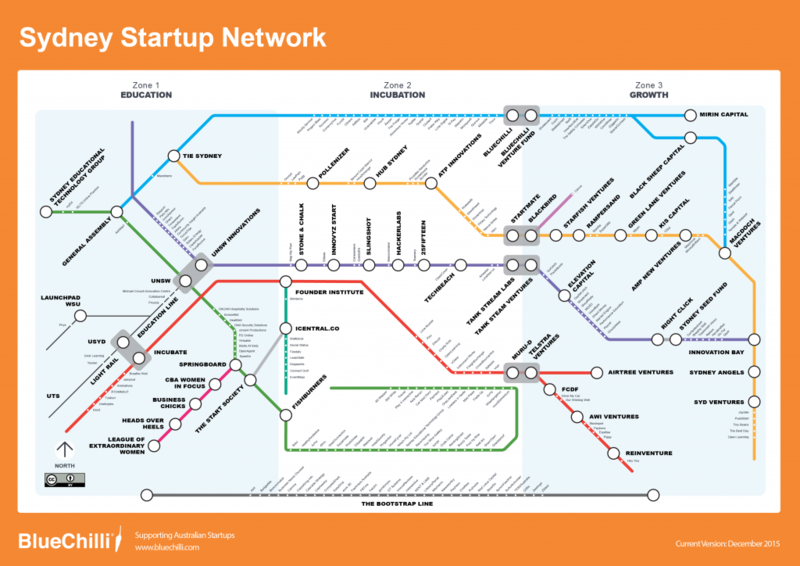 Well obviously there are more startups in both maps, and more organisations supporting them. In this edition you’ll also see we’ve changed the design of the Melbourne map from Melbourne’s train system map to Melbourne’s tram network map, because we think Melbourne’s more famous for its trams than its trains. Do you agree? We said we’d produce StartRail maps for every startup community to submit the valid details for at least 50 startups. So far, only the startup communities in Sydney and Melbourne have achieved that goal. Some of the other capital cities and some of the regional communities have as many as valid 15 startups. We know you can do better than that. We’ll open the online entry form again in early January to start collecting new data, stay tuned. I submitted my startup’s details, why am I not on the StartRail map? You’ve got to be a tech startup. If you’re selling retail beauty products online, or truck parts, or legal advice, you might be a startup, but you’re not a tech startup. There’s no universally-accepted definition of what is (and isn’t) a tech startup but here’s a great Techcrunch article we use as a guide. You’ve got to ship a product. Some submissions were for startups with just a landing page accepting email addresses. A lot of tech startup ideas fail between launching a landing page and shipping a product; we’re not helping the community learn about itself by mapping a bunch of empty landing pages. When you #ship, submit your details to Startrail. You’ve got to be in the community. Even if you still call ‘Straya home, if your business is overseas now, you’re part of wherever, you’re not part of #straya. If you’re in Australia but not based in Sydney or Melbourne, you won’t find yourself on the Sydney or Melbourne map, or plead/goad with the other startups in your local community to submit their details so you tip at 50 entries and we create a map for you. You must still be a startup. Maybe you were a startup once, but once you’re approaching $US50M ARR, or 250 f/t employees, or you’re a subsidiary of Oracle, or you have an employee parking garage, or you spend more time tweaking PowerPoint decks for the board than shipping product, you’re not really a startup. You’ve got to submit your startup’s details. If you’re too busy or too forgetful to submit all your startup’s details, we’re too busy and too forgetful to do it for you. If your investor said they’d do it for you but didn’t, don’t delegate that task next time. We may have made mistakes, but don’t game the system. We’re fallible, we’ve probably made mistakes, and we appreciate you helping us correct them for the next update of the maps. But don’t mess with our shiz or we’ll ban you. That stings. I missed out — how do I get in? Scroll down the page you’re reading now and you’ll see a pop-up that will invite you to subscribe to the BlueChilli email newsletter. We’ll let everybody subscribing to that email newsletter (plus everybody who’s submitted information to past StartRail surveys) know when we’re ready to start collecting data for the next update of the StartRail maps via our online form. We plan on doing an update in the next few weeks.